It's affectionately known as the "Mandocaster," but Fender's actual, unimaginative name for it was "Fender Electric Mandolin." 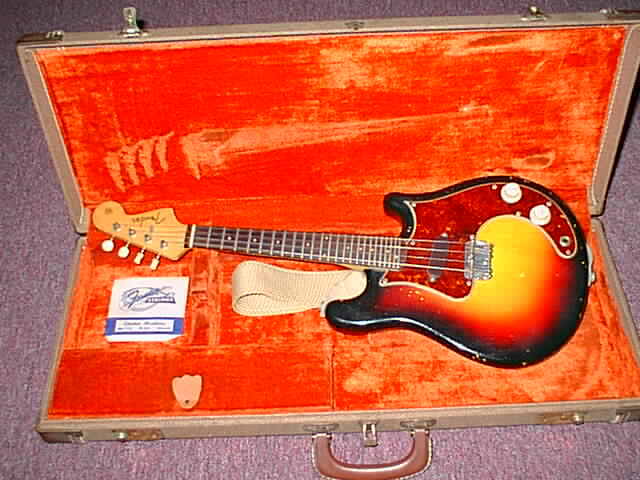 These 4-string, single-course, solidbody electrics were produced from 1956 to 1976. Fender even sold a set of strings for it. 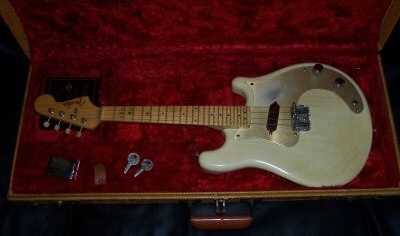 For the first year or so of production, the Mandocaster came only in "Mary Kay" blonde with an anodized aluminum pickguard (see below). Most later instruments came with a sunburst finish like the one pictured above. A few had custom finishes, such as the "Shoreline Gold" and white instruments below or the "Lake Placid Blue" instrument belonging to Sam Bush. And occasionally you find one that's been refinished, like the red one at the bottom. These instruments have been criticized by some, who contend that the pickup placement results in an overly harsh tone. But several well-known players use the instrument. 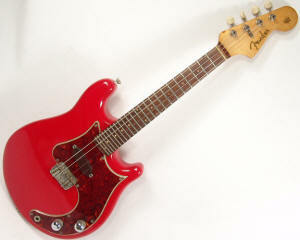 They are somewhat easier to find than a Gibson EM-200, but not quite as ubiquitous as the EM-150. Prices, depending on condition, range from $800 to $2000 or more. In more recent times Fender introduced a line of foreign-made mandolins that included some new electric models.